Current Market Analysis: The best notes from Connecticut were issued prior to 1900. Some 1902 red seals have the chance to be worth good money, but they are still relatively common for the type. Very few blue seals from Connecticut are considered scarce or valuable. The same applies to small size notes from 1929. You want to look out for traditional rarities like first charter deuces. Denominations higher than $20 are also scarce. 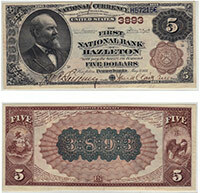 There are lots of beautiful notes from Connecticut that can be bought for very reasonable prices. Generally speaking, the type of note is more important than the town. This is common for banks in New England. We buy all antique paper money issued by The Shetucket National Bank of Norwich, CT. We can tell you how much your $5 bill is worth. We aren’t just dealers. We are also collectors, experts, and appraisers. We have contributed to numerous price guides and are considered specialists in the field of national currency. Contact us via phone or email to get your free appraisal today.